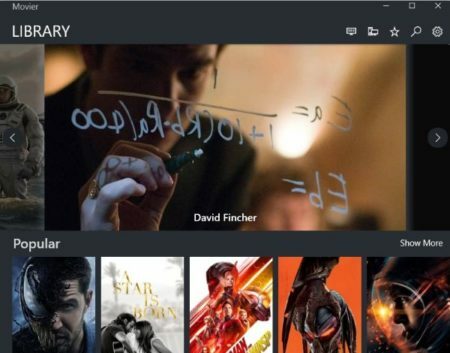 Movier is a free Windows 10 movie and TV shows information app where you can see information on latest movies, upcoming movies, top rated movies, etc. Apart from this the app also provides you information like rating of a movie, runtime, trailers, cast, photos, etc. In case you are a huge movie fan and love to keep a track of latest or upcoming movies, then you should definitely try this app out. You can also get information about latest and your favorite TV shows. The app also lets you create your own watchlist. You can make a library with collection of movies or TV shows you want to watch. As this is the free version of the app, therefore, you can only add 30 movies to your watchlist. In case you want to add more, then you will have to upgrade to the paid version of the app. Get started by downloading this app. Once downloaded go ahead and launch the app. You will see a homepage like the one shown in the screenshot below. On the homepage of the app you will see all the latest movies listed in tiles format. These are the most popular movies which people have been searching for. Now you can browse various categories given like popular, trailer, upcoming, top rated, now playing, drama, etc. You can also search for movies based on actors, director, etc. When you click on a movie title you will see a page like the one shown in the screenshot below. For each movie you will have a movie poster, movie description, cast of the movie, movie rating, genre, runtime, trailer of the movie, photos from the movie, etc. You will have some options under the movie poster, where you can mark the movies as seen, add it to your collection, add it to your watchlist, add comments on it, etc. Similarly, you can see information on your favorite TV shows as well. You can see the latest TV shows, the most popular ones, or search TV shows by actors, directors, etc. Similar kind of information is available for TV shows as well. A screenshot of the same can be seen above. The settings option lets you tweak a few settings. The settings page can be seen in the screenshot below. First of all you can change the theme of the app. 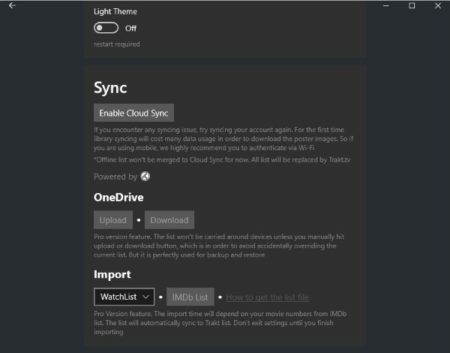 You can choose between a light theme or a dark theme. You also get the option to upgrade to paid version of the app in here. You can also enable the touch mode if you are using the app on a touch screen device. Syncing with OneDrive is an option that is available with the pro version of the app. Track the latest movies and TV shows. Get info on movies like rating, runtime, trailers, overview, cast, photos, etc. Save movies to your watchlist. Search movies by title, actor, director, etc. Choose between dark and light theme. Download photos (available with the pro version). Read details about the cast and director. Movier is a nice app to keep a track of latest movies. It is a good app for movie buffs who are always on the look out for good movies. 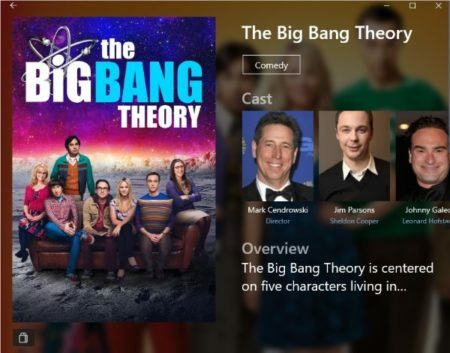 Apart from movies you can also get information on latest TV shows. So you can get both TV and movies info in one place. Nothing better than that. If you like the app you can upgrade to its paid version as well. 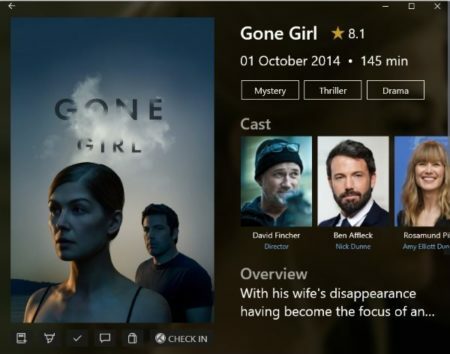 Check out Movier for Windows 10 here.